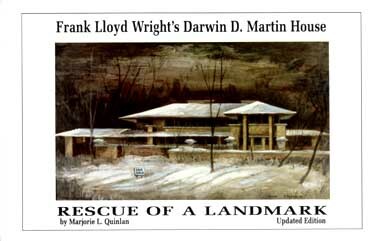 Back in print with an updated edition, this is the untold story of the abandonment and rescue of Western New York's most architecturally significant home, recounted in vivid detail by art historian Marjorie L. Quinlan. "How can one comprehend the disembowelment and desertion of his family home? Was Frank Lloyd Wright the target of his disgruntlement? Did Martin's only son chafe at his father's friendship with Wright, possibly imagining displacement from his father's paternal affection? ... His privileged childhood in that house, and his father's unfailing generosity to him, seem to have instilled in him no sense of loyalty to his father's ideals." The 112-page book includes more than 40 photographs, many of them in color.